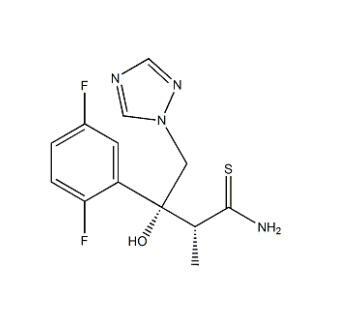 Isavuconazole intermediate 8, also known as (2R,3R)-3-(2,5-Difluorophenyl)-3-hydroxy-2-Methyl-4-(1H-1,2,4-triazol-1-yl)thiobutyraMide CAS number 368421-58-3, It contains two chiral centers, is more difficult in synthesis among intermediates of Isavuconazole. We fully integrated our own excellent technical team and a wealth of industry resources, so that the production process of the Isavuconazole intermediate 8 with rapid breakthrough. After several pilot levels of production, we randomly selected samples for testing, the results show that our quality has been very stable. We are keen to work with our technical team, partners and customers to advance the project and seek the best way to win. Create value for our customers, employees, partners and investors. Looking for ideal 368421-58-3 Manufacturer & supplier ? We have a wide selection at great prices to help you get creative. All the CAS 368421-58-3 are quality guaranteed. We are China Origin Factory of CAS Number 368421-58-3. If you have any question, please feel free to contact us.